We are clearing out all our remaining 2017 models during our Boxing Week Blowout. We have only a few left but we need to get rid of all of them!!! Civic, CRV’s, Accord’s, Pilot’s, Odyssey’s and Ridgeline’s!! Up to $4000 off and rates starting at 0.99% on select models! With the new year, comes the previous year clearout for most Honda dealerships. In order to bring in additional 2018 models, many dealerships will be trying to sell their remaining 2017 models. If you’re looking to get into a Honda, this might be the perfect time for you. Here are some things to keep in mind when considering purchasing a vehicle during the year-end clearout. During our model changeover is one of the best times to buy a vehicle. Many will say it is also the best time to get the greatest deal on a vehicle. Dealers are looking to make additional room for the new models by selling the older ones first. You can typically expect to see larger discounts happening around this time of year. 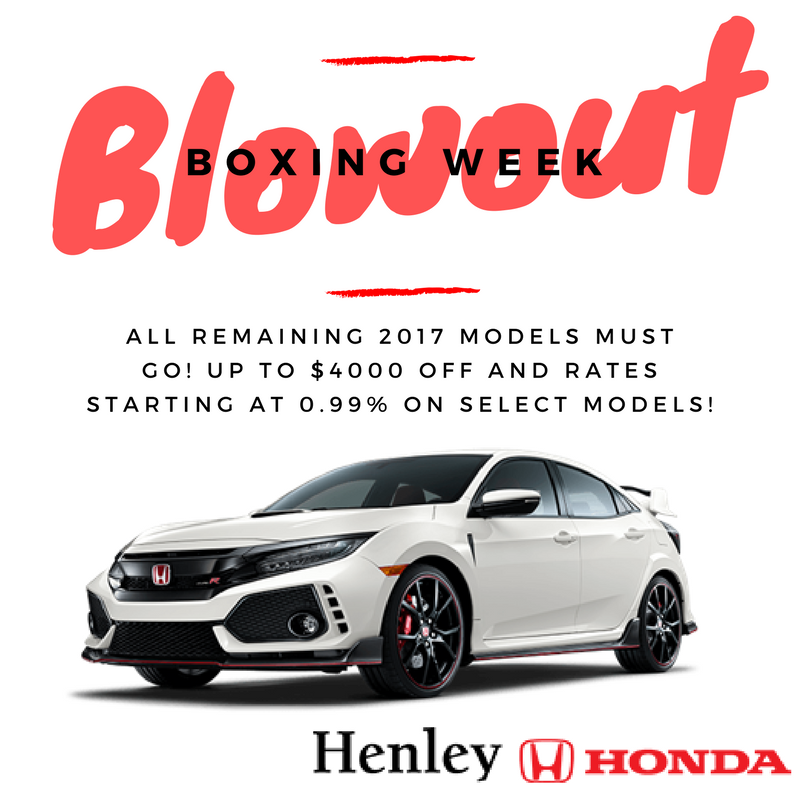 At Henley Honda, we are offering up to $4000 off on select 2017 models. You will highly unlikely see a better incentive when purchasing a new vehicle! Each year cars tend to get better. With additional features available it’s hard to decide whether you want to get yourself into a 2017 or 2018. Well, in Honda’s 2017 models you’re sure to get a top value for your dollar. Over the years Honda has constantly advanced their vehicles design and features. However, you won’t be disappointed with the purchase of a 2017 model. One of the biggest differences in the 2017 Honda models is their price tag. You can receive the same great features as 2018, only at a lower price. With limited quantity, there’s no time to wait. The year-end clearout is sure to draw many customers that are looking for a new vehicle. We have a limited quantity of 2017 models remaining at Henley Honda, so act now before it’s too late. What better way to start the New Year than with a new vehicle? Head on down to Henley Honda to see our remaining selection of 2017 models, before they’re gone.